The Fleur-de-Lys (bourbonian lily), a stylized lily or lotus blossom, counts as a sign for perfection, light and life and is traditionally the symbol of the french king. According to legend Chlodwig, the merovingian king of the Franks, converted to christianity in 496 AD after which an angel gave him a golden lily as a symbol of his catharsis. It is also said that Chlodwig was directed to a save passage over the river Rhine by water lilies so he could be victorious in battle. In the 12th century the Fleur de Lis became symbol of french royalty. Between 1340 and 1801 english kings assumed the lily as a sign of their presumed claim to the french throne. The three-leaved lily can symbolize trinity, the Virgin Mary, creation, royalty and even the unity of body, mind and soul. The resemblance to a spear head builds the bridge to male martial power. 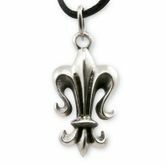 The Fleur de Lys is also the emblem of Florence, the "city of the lily". It also was used as a symbol for the Prieure de Sion (brotherhood of mountain Zion). This is the name of the association founded by french monarchist Pierre Plantard in Annemasse in 1956 in the Départment Haute-Savoie. For a while he published a magazine with the title "Circuit" and was active in the region for about a year. In the 1960s in Paris Plantard tried to revive the association as a secred lodge and equipped it with forged documents which were supposed to prove a history where it was founded by Gottfried of Bouillon during the first crusades in Jerusalem. The documents even claimed that historical celebrities such as Leonardo da Vinci, Isaac Newton and Victor Hugo counted among the members or grandmasters. The prospect of such a secret lodge was then (starting in the late 1960s) picked up by many authors and the media and enriched with ideas from modern esotericism and conspiracy theories.